One of the things I love about cooking on the Yoder Smokers pellet grills is the versitility of foods that they allow me to prepare. I’m not limited to just smoking pork butts, or only grilling steaks. These cookers have the range and consistency to do it all! It’s that temperature consistency that makes even baking a cinch. Whether it’s dump cake out of a box, cheesecake bars or made from scratch pound cake, I can count on the smoker doing the job as well or better than the oven inside the house. Using the creaming method, we’ll start with whipping the butter and sugar, then slowly adding the eggs. Don’t forget to alternate adding your dry and wet ingredients. Great color! This guy just passed the toothpick test. 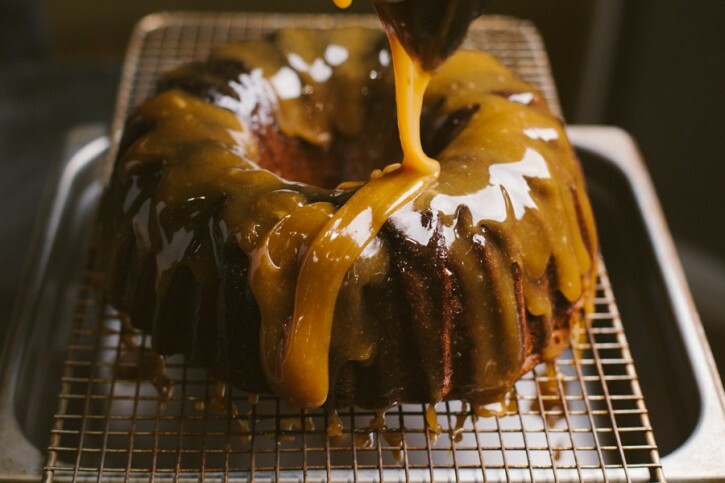 Let’s get to the bourbon butterscotch glaze. The longer you cook it, the thicker and stickier it gets. Keep that in mind and adjust to your preference. Preheat your Yoder Smokers YS640 to 350ºF. 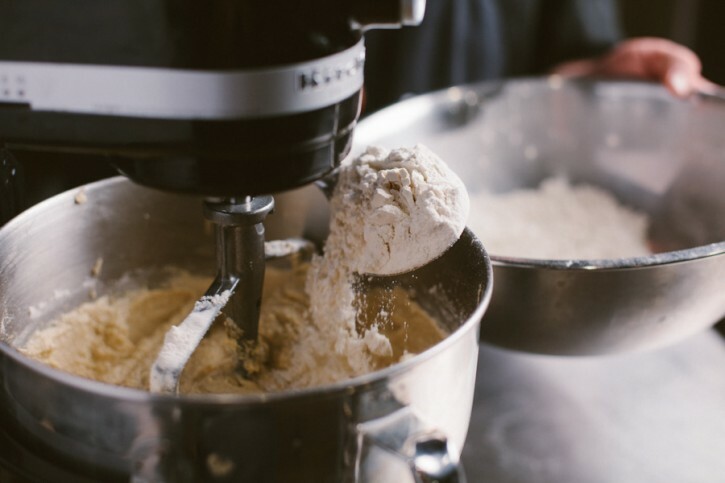 In a stand mixer with a paddle attachment (or with a hand mixer), beat the butter and sugars on medium/high speed until the color lightens and the mixture appears fluffy. Add one egg at a time, letting the it mix in completely before adding the next. 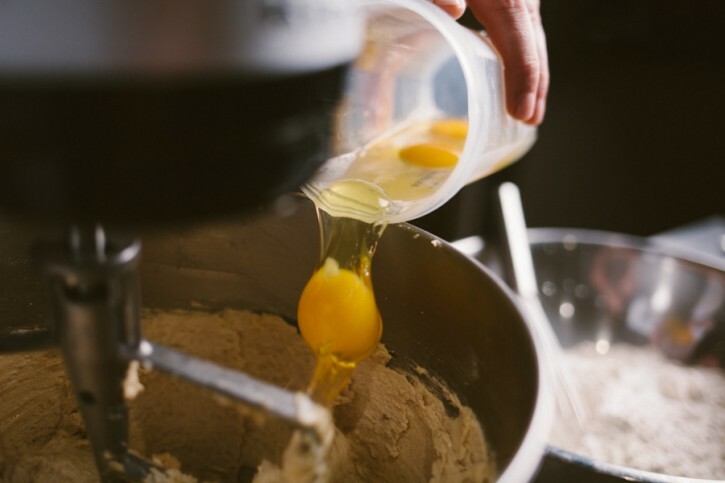 When all eggs are incorporated, scrape the sides and bottom of the bowl with a spatula and mix to incorporate. Combine the flour, baking powder, and salt in a separate bowl. Whisk to break up any clumps. With the mixer on low, add a the dry mixture in three parts and the milk in two, alternating between the two (dry, milk, dry, milk, dry). Mix until just combined. Stir in toffee bits. 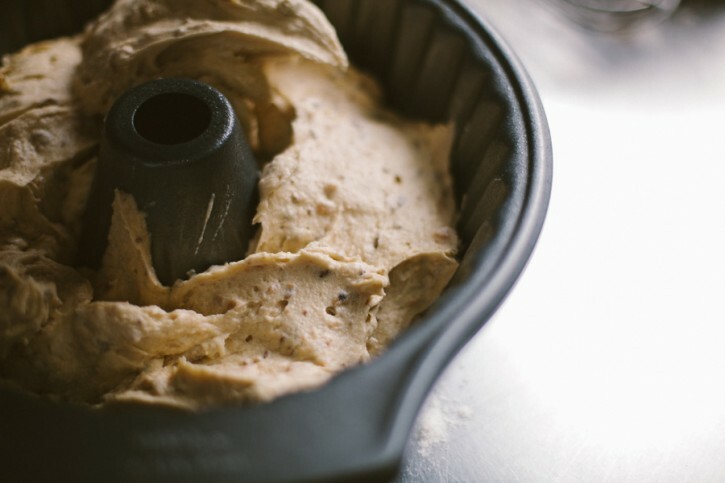 Transfer the batter to a greased 2 quart/10” diameter bundt pan. Bake until a toothpick inserted near the center of cake comes out clean, about and hour and fifteen to and hour and twenty minutes. 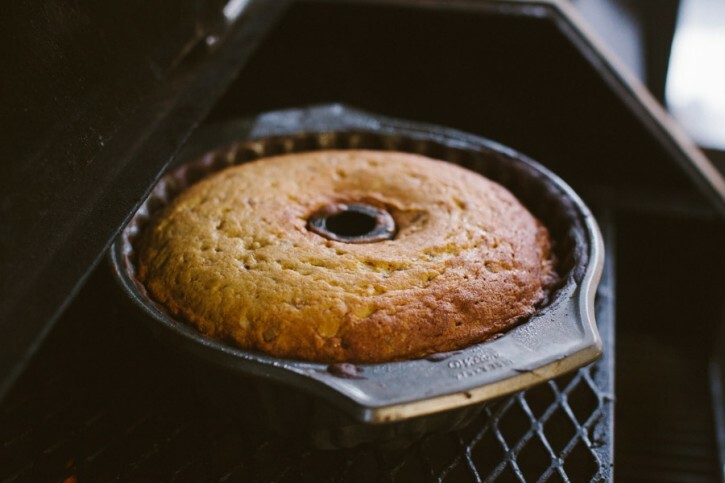 Turn the cake out of the pan and let cool. 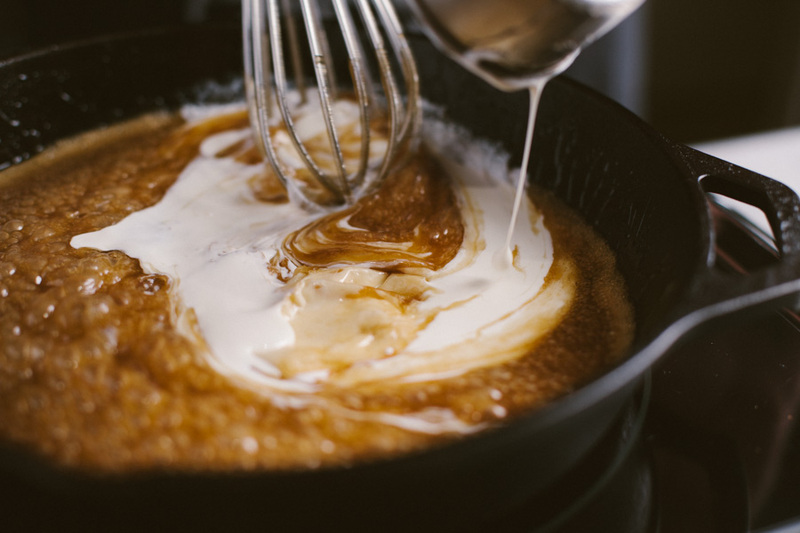 To make the butterscotch, bring the brown sugar, corn syrup, butter, and salt to a boil in an Lodge Logic 10” Cast Iron Skillet, whisking to dissolve sugar. Boil until for about 3 minutes until syrupy and slightly reduced. Remove from heat, add cream and bourbon and stir until smooth. Return to heat source, over low heat. 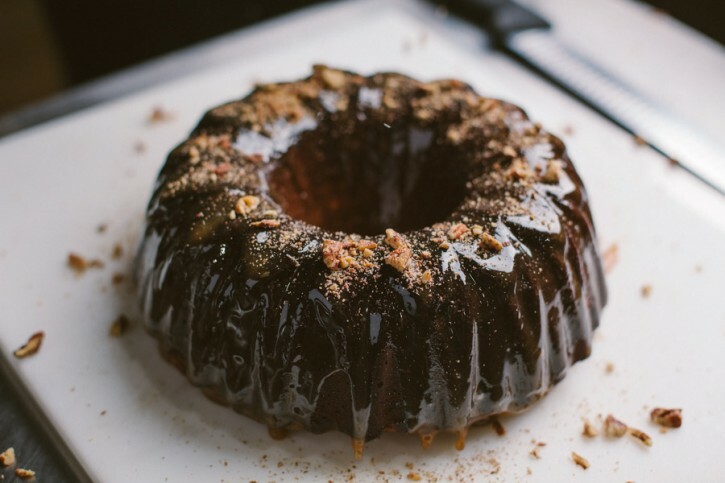 Hold warm until the cake has cooled, then pour over the cake.